Dutch Fishermen Caught A Rare Two-Headed Sea Creature. What Happened Next Horrified Researcher. On May 30, several nautical miles off the Hook of Holland, a boat hauled up something perhaps never before seen by man. Two feet long animal and with two heads. In the cold waters of the North Sea, trawlers catch all manner of unintended things. Garbage, often. Porpoises, sometimes, for the shores of the Netherlands are teeming with hundreds of thousands of them. A photo of the thing began to circulate through the Netherlands - eventually to the inbox of Erwin Kompanje, the curator of mammals at the Natural History Museum in Rotterdam, who was astounded. He recalled his first thought: "Where??" "There are only nine cases known until now" of conjoined twins among cetaceans, said Kompanje, who has studied dolphins, whales and porpoises for 20 years. "Even normal twinning is rare; there's no room in the womb of the mother for harboring more than one baby." And the few specimens that had been found were usually undeveloped fetuses, like the "double monster" - one head and two bodies - found in the womb of a dolphin caught by herders off the coast of Japan in 1970. In 2001, a bottlenose dolphin calf with two beaks was caught in the Mediterranean sea, but it was partially decomposed. And these are among the better-documented cases. The photos Kompanje found himself staring at in shock showed a specimen that - while obviously dead - looked to be in perfect condition. "I think it was born alive," Kompanje said. The brothers couldn't have survived long. They would have either drowned as two brains told one body to swim different ways, or simply succumbed to their single heart's failure to pump enough blood. But whatever happened in their short life, they had by pure luck found their way into a fishing net before nature destroyed their body's value to science. For a researcher hungry for any morsel of information about man's aquatic mammalian cousins, it was a one-in-a-billion discovery. So Kompanje got the boss of the fishing crew on the phone, who was helpful - providing the exact coordinates and details of the catch. The possibilities expanded in the researcher's mind. Kompanje had been planning an MRI for the porpoises. A CT scan, 3-D imaging. And then, when the research was completed, the brothers might be preserved forever in a museum. "They thought it was illegal to collect it," Kompanje said. "They made four photographs and threw it back into the sea. Back into oblivion." Kompanje did what he could with what evidence that chance had preserved. 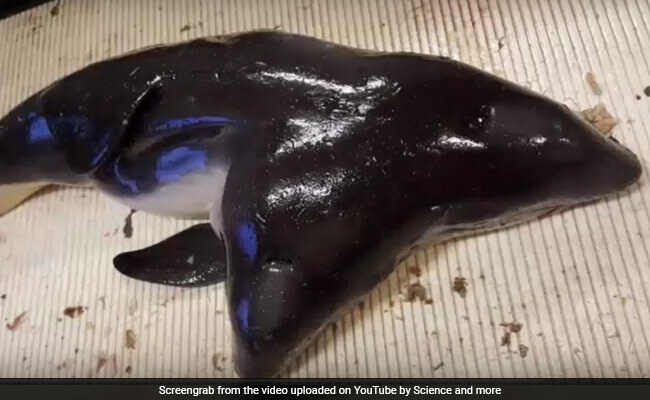 The fishermen's photos from the boat were good enough to co-author a paper with other marine researchers, which was published this month, and said what there was to say about the porpoises. "For a cetologist," he said, "this a real horror."